I just want to preface this post by saying this is not sponsored and I just wanted to share my personal experience with SHEIN with you guys! 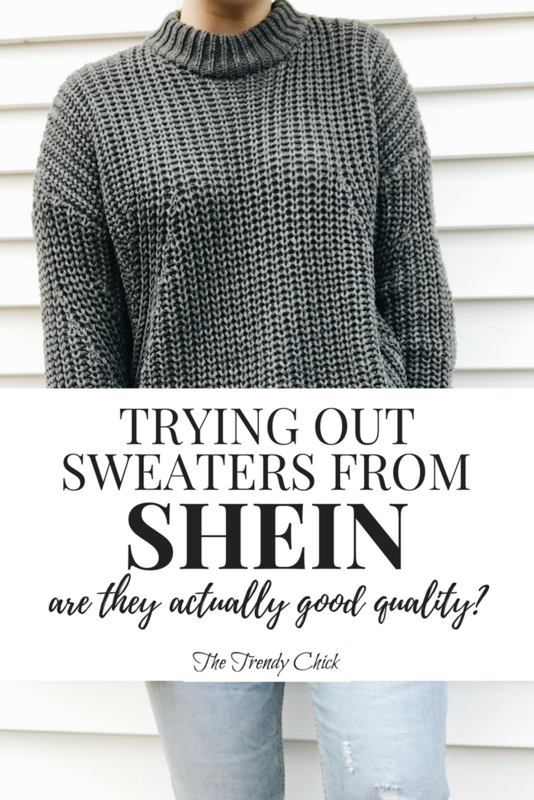 For years I have heard about SHEIN, but I was skeptical since items on there are pretty cheap and sometimes the reviews are not great. So I ordered two sweaters to see for myself if they would actually be good quality. This first sweater is the Drop Shoulder Chunky Knit Jumper and it is $14. Overall, I really like this sweater and I know I will be wearing it a lot for the rest of winter. I was a little hesitant that it might be cropped too much, but it looks great with a pair of high waisted jeans! My only complaint would be that the sleeves are a little long, but that doesn’t annoy me too much and just makes it more cozy. For both of these pieces I would compare the quality to Forever 21 sweaters. They are obviously not going to be the best quality since they are so cheap, but they are still very comfortable and feel like they will last at least a few years. This second sweater is Olive Green Drop Shoulder Textured Sweater and it is $16. This is a piece that doesn’t look like the picture at all, except the color is pretty similar. But I read the reviews beforehand and saw other peoples pictures, so I expected it to look like this! I really like the fit personally, but my only complaint is that the arms are slightly too short. But they aren’t short enough that it looks bad, so I am still wearing it! I will also probably roll the sleeves up once it gets a little warmer out to make it a 3/4 sleeve sweater. Overall, I really like this piece too and it matches so many pieces I already own! The shipping is free, which is always a bonus in my opinion. But it did take almost 2 weeks to get to me. I went into it assuming it would take a few weeks though, so honestly that wasn’t a downfall for me. Always read the reviews. I read the reviews and looked at pictures for dozens of pieces before I chose these two. SHEIN is notorious for not having the picture look like the actual product, or having weird sizing. But people are usually spot on in their reviews, so just checkout any reviews on the piece before you try it yourself! Would I order from SHEIN again? Yes, I would. I love both of the sweaters I got and I have already worn them quite a bit over the past few weeks. Like I mentioned though, I would always read the reviews first so you have a better idea of what it actually coming in the mail.